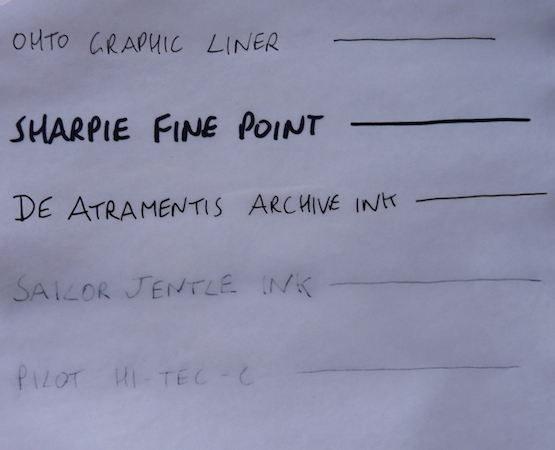 De Atramentis Archive Ink review – Pens! Paper! Pencils! 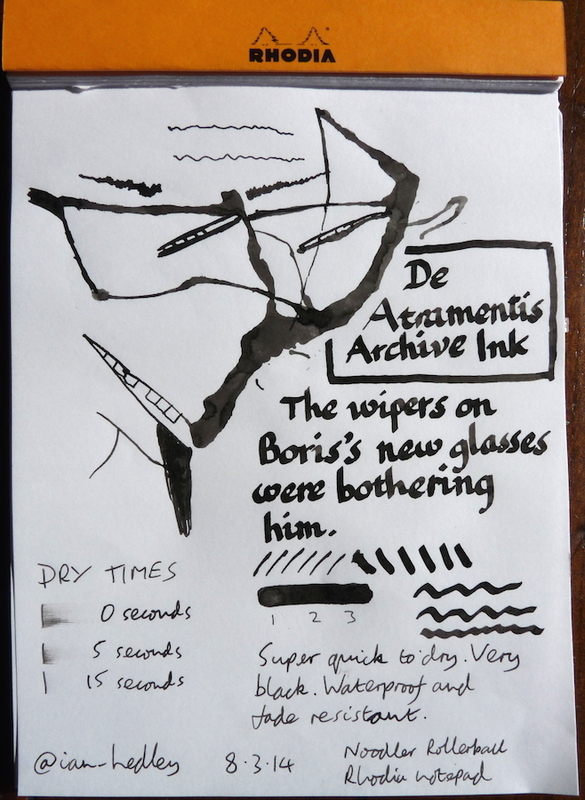 However, what makes De Atramentis Archive Ink special is that it is, in the words of The Writing Desk (who kindly supplied this sample), it is: a permanent and waterproof archive-quality ink for fountain pens. Non-acidic, does not contain iron-gall, light-fast. I had to test it so I wrote out some lines using a couple of pens that are also supposed to be archival quality (OHTO Graphic Liner and a Sharpie) and a couple that make no such claims (Sailor Jentle fountain pen ink and a Pilot Hi-Tec-C). I’d say the De Atramentis holds up extremely well. I think this ink is a winner. It’s a proper black (as in, it’s not grey), it dries extremely quickly and it will last forever. 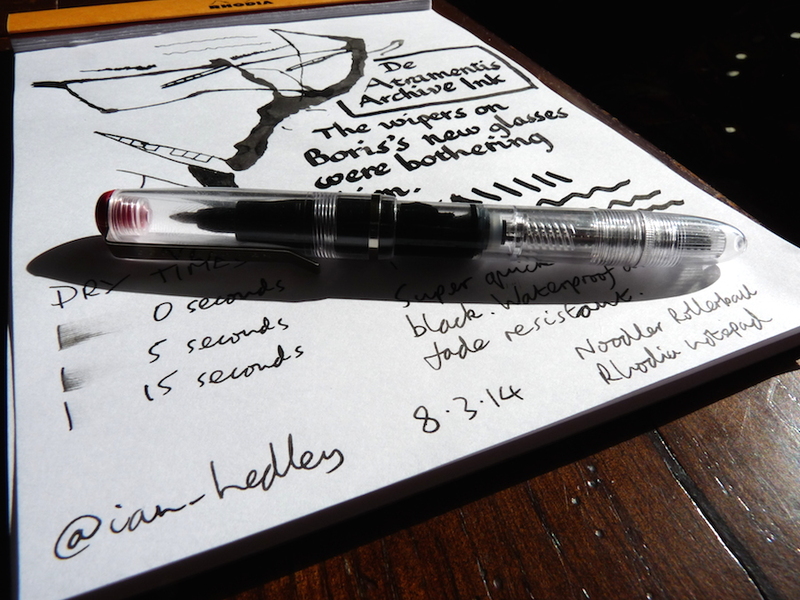 Obviously a little care needs to be taken to avoid it drying in a pen (there is a certain challenge to washing out a waterproof and permanent ink, after all) but as long as you bear that in mind, this is an excellent choice for a black ink. If you would like to buy this ink direct from The Writing Desk look here. 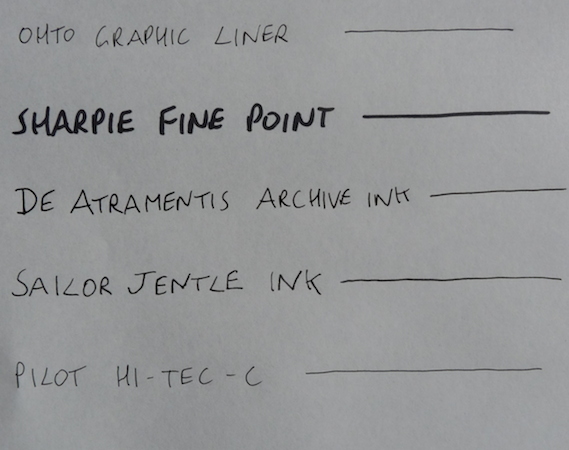 Odd question, but rather important for me – does the ink have a smell? Some permanent inks have a really sharp smell, preventing me from using them, but I’m really looking for an alternative for fineliner drawing pens that wear out after half a drawing.